Now more than ever, it seems that opening title sequences for films are crucial elements of the whole picture. In recent years, the ante has certainly been upped with the introduction of CGI, and we've been seeing some of the most elaborate and attention-grabbing opening titles ever. But let me take you back to an earlier time. Let me take you back to the days of the cut and paste board, and the color wheel; when miracles could not be accomplished with a keystroke. Don't get me wrong, I have great respect for artists and what they can accomplsih with the tools currently at their disposal. But I lose a bit of awe watching giant 3-D letters float above the NYC skyline when I know my nephew probably has a halfway clever friend who could do the same thing on his Macbook. In that aforementioned earlier time, graphic design in film was an entirely different discipline. And men like Saul Bass were at the forefront of a legitimate form of pop art. Not too familiar with the name? You should be. Because along with that of composer Bernard Herrmann, it is his work that first hits the viewer of Alfred Hitchcock's Psycho. He was the guy who first pulled you into that movie and assured you weren't going anywhere for a couple of hours. 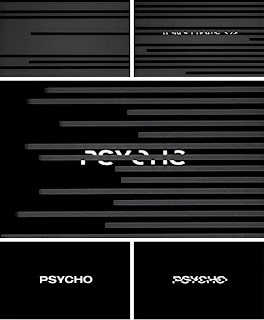 An accomplished visual designer, Bass was responsible for the unforgettable opening title sequence of Psycho. A longtime Hitchcock adviser, he had also done titles for Vertigo and North by Northwest previously. More than just a titles designer, his graphic abilities were put to use by Hitchcock in the design of storyboards and even shot composition. 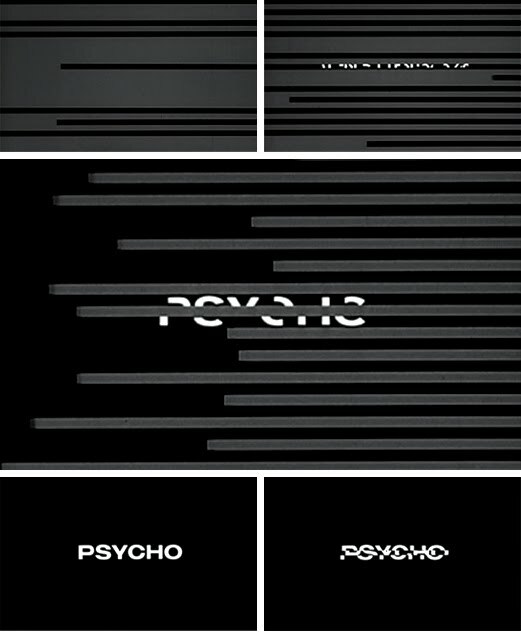 Only a few years into his career by Psycho, Bass would go on to design stunning opening sequences for decades to come. But Psycho would remain his best known work--an urgent, hypnotic, brilliant set-piece that instantly sets the tone for a cinematic classic. In fact, Bass would become known for his ability to do exactly that, to let the viewer know just what he or she was in for. If you've never seen them before, his credits for Psycho grab you from literally the first second the film unspools, and positively demand that you give yourself over to the rich tapestry of intrigue Hitchcock is about to present to you. With Hermmann's unmistakable strings pulsing, screeching and lilting menacingly behind it, Bass' opener throws a series of spiraling linear shapes and interlocking words our way, and right off the bat we're sent into a state of tense confusion. Prior to the '50s, most films had very basic title cards--almost an extension of the literal cards used in vaudeville and other stage presentations. But Bass was part of an a vanguard of artists who helped to change that, and made title sequences far more dynamic, kinetic affairs that engaged the audience in and of themselves. He got his start on the 1954 film version of the all-black modern operetta Carmen Jones. His work on Psycho was clearly prefigured by the work he did in the '50s for movies like The Man with the Golden Arm and Anatomy of a Murder, where he also played with angular shapes and contrasting colors in similar fashion. Following Psycho, Bass was tapped for the title credits to such '60s favorites as the original Ocean's 11, Exodus and the beloved film adaptation of Leonard Bernstein's West Side Story. His opening for Stanley Kramer's It's a Mad, Mad, Mad, Mad World are especially memorable, showing he could employ the same kind of energy and movement to inspire hilarity as well as he could tension. Saul continued to work his magic in later decades, including title credits for another horror classic, Ridley Scott's Alien. In the '90s, he fell in with Martin Scorsese, providing credits for Goodfellas, Cape Fear and The Age of Innocence. In fact, his last project was Scorsese's Casino, which he completed a year before his death in 1996. Psycho, needless to say, provides many reasons to love it, and to take it with you always. The riveting performances of Anthony Perkins and Janet Leigh. Herrmann's score. Hitch's pacing, sense of suspense and overall genius. But whether you realized it or not, another important reason why you love Psycho is the work of Saul Bass--a visionary in the truest sense of the word. You know, I've only just noticed the irony of two key Hitchcock collaborators both doing their last work for Scorsese (Bernard Herrmann being the other)... But is Bass really that underrated? I always thought he was a reasonably well-known figure among people who actually know stuff about film history; maybe your average multiplex inhabitant who doesn't know there were films made before Star Wars wouldn't recognise him, but film students & historians surely would. Film students and historians yes, but that's about it. The vast majority of anyone who's seen Psycho probably is not familiar with him, unfortunately. 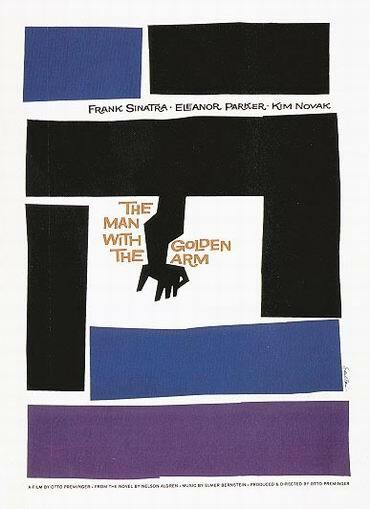 Saul Bass was a great artist and designer. The opening to The Man With the Golden Arm (a great film) seemed to change the way things were done to this day. I guess now the deal is to copy the title sequence to Se7en (which was a great title sequence) to death. David Cronenberg must have been paying homage to Bass with the opening to Naked Lunch. For those who are aware of the graphic and design aspects of title sequences, and what makes them great, Saul Bass is a legend. But, many still are not familiar with the likes of Bass and Maurice Bender. I think its great that you highlight the man's work in this post, B-sol. Thanks for this. Yeah, good post. About what Uranium Willy said about Naked Lunch, I always thought they were riffing off the covers for the old Grove Press editions of Burroughs's books but it seems to reason that there may have been a Bass influence as well. And let's not forget there were some incredible titles in the 40's. Effects done with backwards smoke or drippy liquids forming creepy letters must have been revolutionary at the time. Thanks guys. And yes, there were some impressive title sequences done in the 1940s, I shouldn't have short-changed them like that. TRAILER TRASH: Invisible Man Edition! Bram Stoker Award Winners Announced! Shark Shenanigans at 92Y Tribeca! TRAILER TRASH: Paul Naschy Edition! TRAILER TRASH: Jekyll & Hyde Edition! TRAILER TRASH: Roger Corman Edition!